I started writing after reading the epic tale “A Suitable Boy” by Vikram Seth. I didn’t really care for the political backdrop of India during the time of its independence and Partition in the late 1940s, but I relished the glimpse into a world I knew almost first-hand, that of the Indian culture. You see, I’m a 3rd generation Indian born and raised on the island of Mauritius. I, a Muslim, grew up among Hindus, Tamils, Chinese people, African-origin peeps, mixed race folks...and on the outskirts of ‘our’ world were the White descendants of the island’s former colonists (mainly French, and English). I’ve always wanted to write, and after seeing what Mr. Seth managed to do with his tale, I wanted to do the same thing for Mauritius – to showcase the life of culture, mores, traditions, and values we all lived here as members of the Indian diaspora. This is the world I know, and I wanted to share it. That’s how I started THE OTHER SIDE (Island Girls #1), the story of an Indo-Mauritian divorcee who leaves London and returns to the island, only to be shunned because she dared get a divorce. To make matters worse, she crosses paths with her first love, the one that got away...and he turns out to be a White man, descendant of French settlers who brought indentured labour from India to work in their cane fields after the abolition of slavery. The book had everything I wanted to see in a story that would reflect my culture – societal opposition, gossip, overbearing mothers and matchmaking aunties, and the setting was my beautiful island that I tried to showcase both in its physical and lifestyle aspects. I was a newbie, and I wanted to write. So I listened to those people, and shelved the books I wanted to continue writing. I dabbled into other genres – all of them falling into the ‘mainstream’ of popular fiction. Rom-coms set in London, romantic suspense set in Europe.... My heart still beat for the cultural stories, though, and I guess that showed in my work. I went through a dry spell at that point – nothing of mine was ‘selling’, and in a way, no wonder, because these were perfunctory writings. You know how they say that when you’re passionate about something, it shows? Well, this applies to books, too. Your passion shows in your writing – at one glance, an editor first, then a reader, can see which story was close to your heart because something intangible will resonate from those words, leap off the page to grab whoever is reading. That’s passion, and you need it to rise above the slush! Case in point – around October of 2011, a friend of mine who was with Decadent Publishing emailed me about their 1NightStand line. The premise was that Madame Evangeline, who runs the agency, pairs 2 people on a blind date aka a one night stand. They can choose to be together just for the night, but more often than not, Madame Eve works her own brand of ‘magic’ because she brings together people who are totally suited for one another. The best thing about this line, my friend pointed out, was that the stories could take place all over the world! I thought, what have I got to lose? This story could be set in Mauritius, and it could have an echo of the cultural themes I loved to infuse in my work. I’d reached rock bottom by then, and so threw everything I had into this story of a Mauritian career girl who wants to forget for one night that she is an executive vice president of legal affairs and of mixed race, with no ‘side’ truly accepting her, and just be a woman. Madame Eve pairs her with a Swedish expat who’s working on the island and who’s not at all looking for The One. Clash of cultures, shroud of expectation, doomed-before-it-starts story between these two...can they make it when morning comes? ONCE UPON A STORMY NIGHT was born, and written, and polished, and subbed....and about a month later, I had a contract offer in my inbox. The kicker? The editors for the line had loved the unique, ‘different’ setting that I exploited without turning it into a guidebook, and they also adored the cultural slant of the conflict that made this story rise above the meeting of two career people who might’ve met their match. I had thrown all of my passion into that story, writing what I wanted to write, showcasing what I wanted the world to see, giving conflict I knew first-hand because this was my world, my universe, and – as I’d always known it deep down inside – my niche in writing. That story was my rise above the slush pile, and since then, I haven’t looked back. I now write what I want to write – evident in the Island Girls Trilogy, of which Book 2, LIGHT MY WORLD, just came out – and this enables me to satisfy my passion and also bring it to other genres I also love (like, I have series about small town romances set in England). Want to rise above the slush pile? Write what you want to write, what your heart is telling you to write, what your passion will fuel! That’s the real ticket! 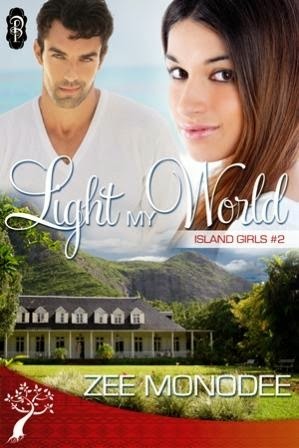 But looking and finding are two different things, especially on the tiny island of Mauritius… When her path crosses surly British widower Trent Garrison’s, it’s hate at first sight. And though fate keeps pitting her against him, she’s certain he can’t be turned into a frog let alone a prince. Can this modern-day princess overcome her own expectations and see beyond the ogre to the man beneath? Break from Social Media--- 2 Weeks for Sure!